Just as our supplies of frequently used items such as canned cat food, paper towels and dish detergent were running low, Andy Cochran came to our rescue. 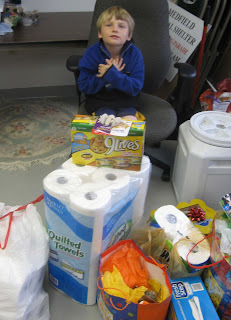 Andy recently turned 7 and asked his friends to bring donations for the Medfield Animal Shelter, rather than gifts for him. In addition to this generous gesture, Andy and his family also help the Shelter on a daily basis by fostering cats and kittens in need.